We arrived at Hotel Excelsior Planet, opened the car door and were nearly knocked flying by the force of the wind. Our driver beat a hasty retreat after helping us to get our bags into the hotel. The wind had been so strong all day that nearly all the lifts had been closed, including, of course, the link to Switzerland and Zermatt. It was early evening and the windswept, snow-covered town centre, lit by myriads of lights, was almost deserted. After a brief exploration, we took cover from the wind in a cosy bar with a crackling log fire and comfy armchairs in the hotel Samovar. Fortunately, back at our hotel the turbulent weather was quickly overshadowed by the exceptional cuisine under chef Fabrizio Reffo. The quality of the food and stylish design make it very popular with guests and locals alike. Early the next morning, I drew my curtains to see a magnificent view of the Matterhorn, or Monte Cervino as the Italians call it. Our guide for the day Luca Caruso greeted us with a look that meant bad news. Indeed all the major lifts accessing the main skiing were closed. But they would open soon, Luca assured us and at 11 am they did. There is nothing better than being shown around a resort by a passionate guide. Having lost two hours of skiing, Luca was determined to cover every corner of the ski area and at speed. With the lifts to Switzerland still closed, we headed up a fast chairlift and then gondolas to Plan Maison and on to Laghi Cime Bianche. Cervinia is a high, snow sure resort and the pistes were in fabulous condition. Luca, who snowboarded with equal passion to his navigating, kept monitoring the lifts on his phone so as new areas opened we were there. 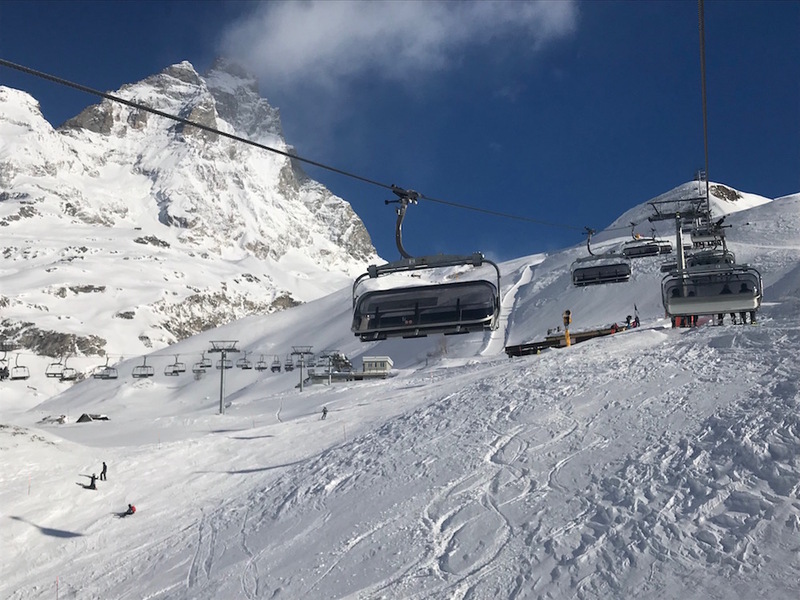 Cervinia has lovely top to bottom, long cruisey runs, including the Ventina (run 7) from Plateau Rosa at 3480m to the village at 2050m – one of editor Watts’ favourites. It also has one of the world’s longest pisted runs (a claimed 13km) from Plateau Rosa to Valtourneche at 1525m, interrupted only by one short chairlift. With more than half the piste map under our belts, Luca’s next proposal was of the gastronomic variety. A blue run above Plan Maison took us to the very atmospheric Chalet Etoile, a long-standing favourite of WTSS and its readers. Used to both skiers in a hurry and others who linger, the waiting staff swung into action. Beers and my deliciously strong Bombardino (an Italian version of an Irish coffee including an egg-based liquor) arrived pronto. 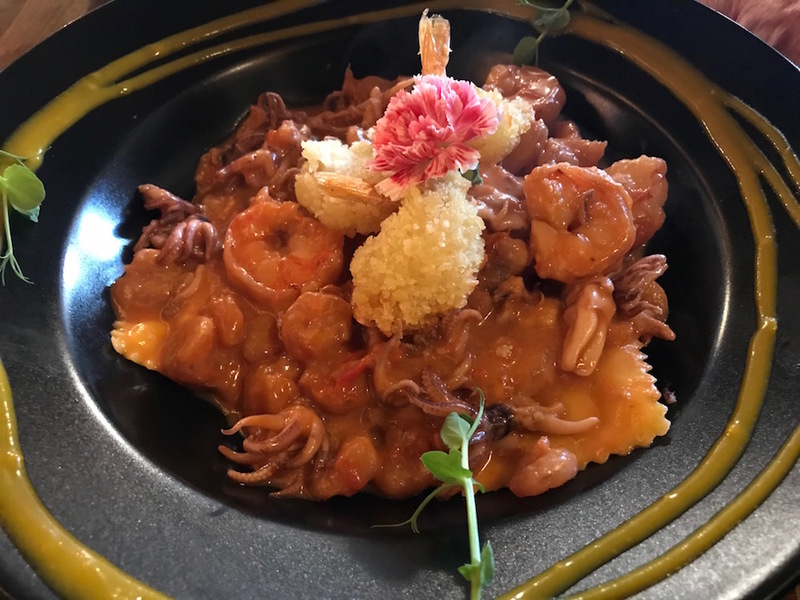 With a reputation for excellent seafood, Editor Watts and I had to loosen our belts for two of their lobster and pasta signature dishes which we thought rivalled some of the best-known restaurants in Zermatt. As we sipped our espressos, I asked if it was always busy. Luca advised that it was best to book a table at least a week in advance; he had booked two weeks ahead. Fortified and inspired by the high mountain scenery, we headed to Switzerland. Although there wasn’t time to explore the Zermatt ski area, we had time for Dave’s favourite run, and then another over by the Theodulpass. As the afternoon stretched on we explored a number of runs, primarily red, and an off piste area above Plan Torrette with stunning views of the Matterhorn. For our final run, by which time the sun has disappeared behind the peaks, we had the pistes to ourselves. The snow was perfect and our tummies and smiles equally big.